Living in France this past year has taught me many, many new ways of doing things. I've learned how to live the good life, French style. I shop more French, stopping at the bakery for my bread, going to the Saturday market for my vegetables, fruit and eggs, and visiting the grocery store every other day or so instead of doing a big weekly shop. My coiffeuse, Sandrine, comes to my house to cut my hair. I eat my meals in courses, drink aperos instead of cocktails, and wait until the village shutters begin to open before walking my dog on Sunday mornings. Being an ex-pat is a constant learning experience! 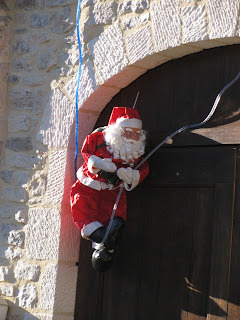 I'vealso enjoyed learning how Christmas is celebrated in my part of France. Most of it I like a lot. Christmas is very low-key. No excessive pressure to decorate, give gifts, or throw the biggest party of the year. Christmas is much more about family here. However, there's one part of Christmas in France that bothers me. 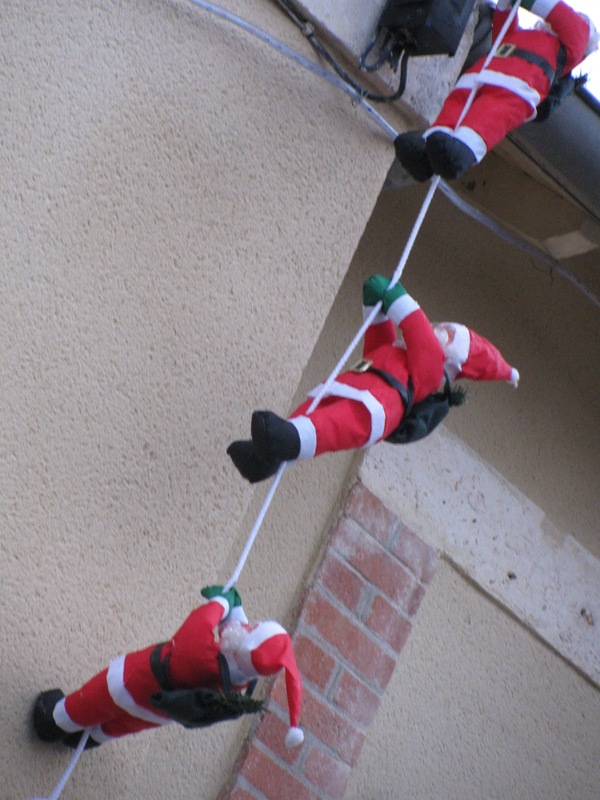 It's these dang dangling Santas! They're everywhere...hanging from walls, roofs and windows. My neighbor has one sitting on a swing on his porch. Santa does not arrive on Christmas Eve in a sleigh pulled by eight tiny reindeer. Somehow he simply appears with his climbing gear, rappelling ropes and backpack of goodies and sneaks his way into the house. Haven't these people ever read "The Night Before Christmas?" Actually I'm sure all this climbing makes more sense than some big ol' fat guy arriving from the North Pole in a sleigh pulled by reindeer, and then sliding down the chimney, but hey! I miss the sleigh. And I ask you...where the heck is Rudolph?? I'm participating in the blog hop today. Please take a moment to leave a comment on this post. On Dec.18th I will select one name at random to win a packet of note cards with Melanged Magic photos on them. If you're a winner, I will post your name on Dec. 18th and either contact you via email or you can email me your mailing information. And please visit these other blogs as well. They're all new to me, and I intend to spend most of my free time this week reading each and every one. Ah, yes, the French Santas really are something. I wrote a post on the same topic last year when we were spending Christmas in Normandy. I've never seen anything like them in Australia! Evelyn, thanks for stopping by my blog. I hope you have a great time bloghopping! Like you, I like Christmas down here. But I hate those wretched suspended Santas! Typically, I've been out all day and won't get round all the other blogs today. Something to keep me occupied in my spare (!) time this week. Hi Evelyn, thanks so much for taking part in the blog hop. I have two climbing Santas. They are very strange. Santa has spectacles and green mittens! I bought them for our first French Christmas so, ghastly as they are, they're very much a part of tradition now! And you're right - reindeer rarely make an appearance with Pere Noel. Our local one who visits the schools seems very rickety and walks with a stick, so maybe he's not robust enough to handle eight feisty critters! I'll have to look for hanging Santas in the future! How interesting! I had a problem with all of thos e dangling Santas too. I thought oh boy how they must shamelessly lie to their children about them. Santa is practicing for the big night. Enjoy your low key Christmas because I know I definitely will. We wont be spending Christmas with my husband's family will be staying at home in Normandy the four of us. I won't miss those Big gargantuan meals that are always served. Don't get me wrong, they're really good but I always wind up with the dreaded" crise de foie". Happy holidays! We spent last christmas in France an oh my what a gastronomic experinece- The meal went on for 8 hours topped off with masses of chocolate desserts. Love your santas makes me feel homesick! I do admit to having some hanging Santa's, but we do also have the reindeer's antlers for the horses. Ha! Yes, the hanging Santas are everywhere. They really only bother me when people forget (or refuse?) to take them down! I agree it's abit unrealistic to expect father christmas to come down the chimney - but Rudolph is essential! Our three christmasses have been crazy here till now, but this year I feel that we are, at last going to be calm and sociable (is that possible at the same time?) and enjoy it. Only I don't agree with French idea of opening presents on Christmas Eve, no matter how much the kids want to. That evening is for carols, snow (hopeful) and a glass of liquer in front of the fire. Enjoy yours! These father christmas's always make me think he's casing the joint and about to remove things rather than leave anything! You're in luck - tracked down Rudolph in quantity in Rouen. They were after the sweeties at the Marché de Noel.